American swimmer Ryan Lochte and three of his Olympic teammates were not the victims of an armed robbery, the city's civil police chief said Thursday, adding that people in Rio deserved an apology for having their reputation "dragged in the mud." He got that apology later Thursday from the United States Olympic Committee, which called the incident a "distracting ordeal in the midst of what should rightly be a celebration of excellence." Lochte initially said that he and teammates Jack Conger, Gunnar Bentz and Jimmy Feigen were held at gunpoint and robbed after a night of partying on the final night of Olympic swimming. But Civil Police Chief Fernando Veloso said they were not victims of any violence of any sort and instead committed vandalism themselves at a gas station bathroom. The USOC offered its apology to the Olympic host city late Thursday night in a statement that described the events in much the same way that Veloso did, including that one of the athletes committed an act of vandalism as part of a confrontation with gas station security guards. "The behavior of these athletes is not acceptable, nor does it represent the values of Team USA or the conduct of the vast majority of its members. We will further review the matter, and any potential consequences for the athletes, when we return to the United States," said the statement from USOC CEO Scott Blackmun. USA Swimming's executive director said in his own statement that the organization will review the incident and that the athlete's behavior is not condoned. Veloso called for the apology in Portuguese at a press conference, one day after Conger and Bentz were pulled off their plane at Rio's international airport while attempting to fly back to the U.S. The pair's passports were returned Thursday and they have departed Rio, according to the USOC; they were seen at the international airport Thursday night. Veloso said both swimmers were questioned over the incident, which police were still investigating, and that one had confirmed Lochte lied. Brazilian authorities have not been able to make contact with Feigen, he said. The USOC did not know the exact content of Conger and Bentz's statements to police, and said in the statement late Thursday that Feigen "provided a revised statement this evening with the hope of securing the release of his passport as soon as possible." It did not include information on Feigen's whereabouts. The saga over the robbery allegations, first brought to light by Lochte's mother, has become a major talking point at the Olympics, where the U.S. leads all nations in medals won — thanks in part to its swimming team — and the city of Rio de Janeiro has been under scrutiny for endemic violence that at times encroached on the games. But the police account also raised questions about whether it's possible Lochte and the swimmers believed they were victims of a robbery. At least one security guard pointed a gun at the swimmers during a dispute at the gas station, and it wasn't clear if it was an appropriate use of the gun, Veloso said. Lochte's attorney has maintained that a robbery took place and insisted the swimmer had nothing to gain by making the story up. He, as well as Lochte's father and agent, did not return phone calls to The Associated Press seeking comment. The swimmers could potentially face punishment — probation, suspension, a fine or expulsion — under USA Swimming's code of conduct, which prohibits dishonesty or fraud. It was not immediately clear if the swimmers would face criminal charges in Brazil. But the USOC's apology acknowledged the distraction the investigation became during the games: "On behalf of the United States Olympic Committee, we apologize to our hosts in Rio and the people of Brazil for this distracting ordeal in the midst of what should rightly be a celebration of excellence." Police initially learned of the alleged robbery from social media, Veloso said, and were forced to launch the investigation without much help from the swimmers. "We had problems from the beginning, we weren't able to have contact with the athletes and they didn't allow us to understand what had happened," Veloso said. "But we can confirm at this time that they were not victims of the crimes they alleged occurred." Veloso said the swimmers broke the soap dispenser, mirror and other items in the gas station's bathroom, which alarmed a worker who went to check on the commotion. "This was a case of vandalism," he said. Rio 2016: Team USA's Best Olympics Ever? He said the first tip investigators received was from a taxi driver who told police he overheard two girls that he picked up at the Casa França nightclub, where the four athletes attended a party in the city's south zone, alleged to have "hooked up" with the swimmers. Veloso did not say whether the driver mentioned any specific names. "This led me to believe that the swimmers, or at least one of them, may have a motive to tell a story that was not true. If an athlete is in a relationship and doesn't want their partner to know they were out all night long, he begins to have a motive to hide that," Veloso said. 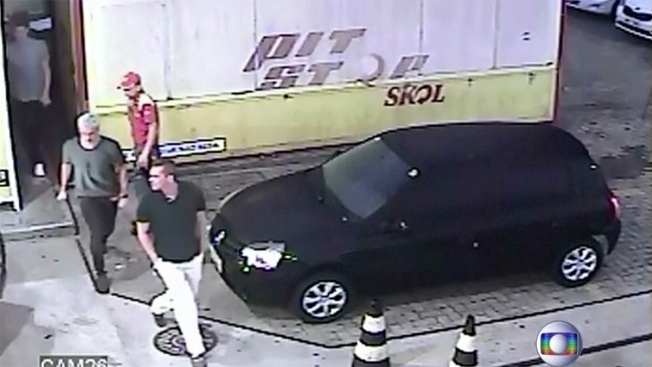 Off-duty officers who were at the gas station early Sunday in Rio's Barra da Tijuca, and had called police, came forward with a different account of what transpired. They said they didn't intervene at the time because they didn't have their badge. Security guards at the gas station were apprehensive to speak to police because the athletes were well-known Americans and "feared retalitation," Veloso said. But they realized they needed to come forward and provided similar accounts, he said. He said one of the U.S. swimmers who was being questioned Thursday said Lochte was intoxicated and the most aggressive of the group, which contributed to the situation escalating. The swimmers ordered their taxi to leave the gas station but the cab driver refused, at the request of the station's manager, according to Veloso. The quartet got out and attempted to get into another taxi. Security guards approached them and demanded they wait for police. Veloso said that at least one security guard pointed a gun at the swimmers to "scare them" during a dispute at the gas station. One of the swimmers was acting belligerently, he said. "We can't say whether it was appropriate or not," he said of the guard pulling out his gun. 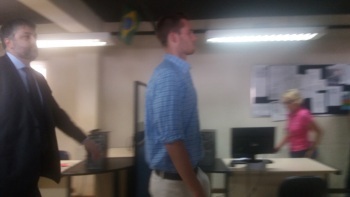 American swimmer arrives at Rio police station Thursday afternoon, Aug. 18, 2016. A third party who spoke English intervened and translated between the swimmers and the security guard, and let them know that they needed to pay for the damage. They accepted and handed over 100 reals and $20 USD, Veloso said. The taxi driver also came forward, and confirmed the account that the police officers and security guards told. "The only truth they told was that they were drunk," Veloso said. Before Thursday's press conference, police said they had found little evidence to support the swimmers' claims and that they were unable to provide key details to support their story in interviews. The office of Judge Keyla Blanc De Cnop, who ordered the passports seized, said there were discrepancies in the statements by the swimmers. In his deposition, Lochte told investigators the swimmers were held up by one armed robber who demanded he hand over all of his money. Lochte said he gave the alleged suspect $400. But Feigen, in his deposition, told investigators that the group was held up by several assailants and that only one was armed, according to the warrant. Lochte's lawyer Jeff Ostrow had refuted the judge's allegations of conflicting stories between the quartet, telling NBC Wednesday that he didn't know what the other swimmers said, but "the story happened the way Ryan provided in his statement." The swimmers also told investigators that they left the nightclub at around 4 a.m. But Rio police deputy Alexandre Braga told reporters outside the police station Wednesday that the time stamp on Casa França's surveillance video showed the quartet left at 5:45 a.m., nearly two hours later. In a phone interview with "Today's" Matt Lauer Wednesday, Lochte vehemently denied that he'd made up the story of a robbery to cover for some other behavior. “I wouldn’t make up a story like this, nor would the others,” Lochte said, according to Lauer, who recounted the interview to anchor Bob Costas during NBC’s Olympic broadcast Wednesday night. But Lauer noted that Lochte changed details of his earlier account, saying the taxi he was in with his teammates had not been pulled over by men with a badge. Instead he said they were robbed after stopping at a gas station. He also said the gun had been pointed in his direction, not pressed to his forehead, as he earlier maintained. Before Conger and Bentz were pulled off the plane, court officials had called for the four swimmers' passports to be seized. Lochte already had returned to the United States by the time the order was made. "Because we are in the middle of Olympic games, we were very lenient in giving them time to come forward on their own to answer questions," Veloso said of Bentz and Conger. "But when we heard they were boarding a plane, we realized they had no intent to cooperate with the investigation and we were forced to intervene." A lawyer for Conger and Bentz said early Thursday they wouldn't be allowed to leave Brazil until they provide testimony to investigators. Sérgio Riera told OGlobo that he had advised his clients to not make any statements until Brazilian officials establish that they are being questioned as witnesses. "They were shocked. They were taken off of a plane and told that they needed to be deposed in a coercive manner, which, of itself, is a departure from the judicial norm," Riera said. "The deputy insisted that they would be heard as witnesses, but with their passports being detained, we — and rightly so — have doubts that they were really being heard as witness. And so, until that is clarified, they did not provide a deposition." Mario Andrada, a spokesman for the Rio organizers, said he was relieved that the story had turned around. "Let's give these kids a break. Sometimes you take actions that you later regret," Andrada said. "Lochte is one of the best swimmers of all-time. They had fun, they made a mistake, it's part of life, life goes on, let's go." The USOC and USA Swimming statements came just before midnight local time. USA Swimming Executive Director Chuck Wielgus did not apologize, but said the athletes' behavior "is not representative of what is expected as Olympians, as Americans, as swimmers and as individuals. "That this is drawing attention away from Team USA’s incredible accomplishments in the water and by other athletes across the Olympic Games is upsetting. The athletes and their remarkable stories should be the focus," Wielgus continued, thanking the USOC, U.S. State Department and consul. The organization will review the incident and determine if it should take any further action under its code of conduct, Wielgus said.